Solitary erect rattan, rarely “stemless”, usually up to c. 3 m tall, rarely longer. Stem without sheaths c. 2 cm diam., with sheaths to 4.5 cm diam., internodes short, rarely exceeding 5 cm. Sheaths bright green, armed particularly along the margins with crowded long black or brown spines, 8 cm long, the middle part of the back of the sheath usually quite unarmed or armed with very sparse much smaller spines, spines around sheath mouth much longer, often almost papery, to 10 cm, ± erect; knee absent; ocrea usually inconspicuous. Flagellum absen. 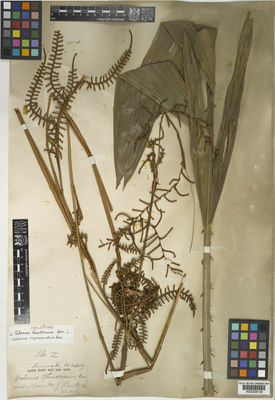 Leaf ecirrate to 2.5 m including petiole to 1 m; petiole armed with spines to 4 cm long along the margins and mid line; leaflets rarely more than 10 on each side of the rachis, distant, ± opposite, usually broad lanceolate, ± plicate, cucullate, the longest to 45 × 9 cm, very sparsely armed, transverse veinlets conspicuous. Inflorescence to 2 m long with few distant partial inflorescences; bracts tubular, only slightly inflated, scarcely expanded, ± unarmed; partial inflorescences to 40 cm long; male rachillae 4-30 mm long; female rachillae to 80 mm long. Mature fruit rounded, relatively small, c. 5 mm diam., conspicuously beaked, covered in c. 16 vertical rows of reddish-brown scales. Seed rounded; endosperm homogeneous. Seedling leaf not known. (Fig. 49). Scattered throughout the State. Elsewhere in Sarawak and Kalimantan. Endemic to Borneo. Used for walking-sticks and the framework of baskets; shoot is said to be edible.